It’s been a crazy-busy couple of weeks for me lately, hence the trickle of blog posts (lots of half-written draft ones coming one day…). 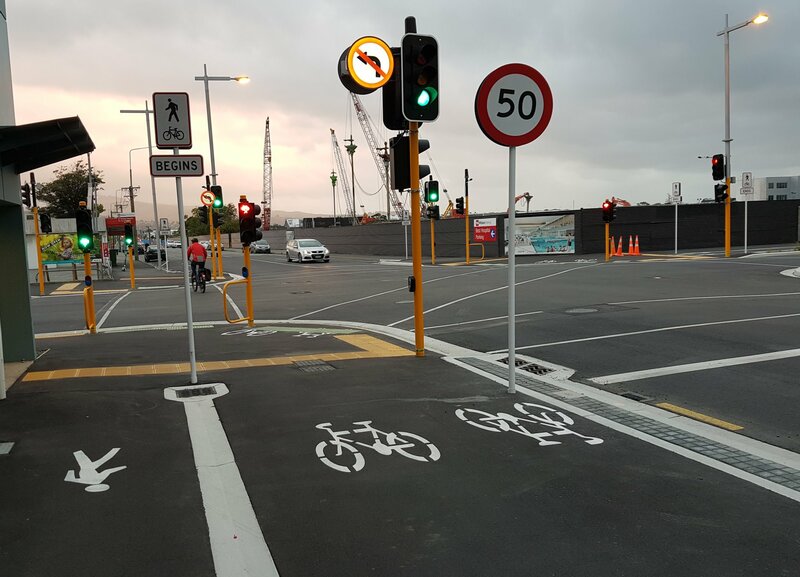 In absence of a full-length post or two, here’s a quick look at one of the latest cycleway developments in town, I just noticed last night. 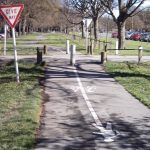 This intersection is the junction of major cycle routes along the one-ways to/from the east, south to the Quarrymans Trail, and connecting west to South Hagley Park and the Little River Link. A two-way separated cycleway runs along Antigua St, connecting north to Tuam St, the newly opened Oxford Promenade, and the Boatshed Bridge. At this end shown here, you either continue south along Antigua on one-way cycle lanes (ultimately to be separated) or west along a two-way path on St Asaph. Hence the diagonal crossing that you can see in the photo. Some of you will recall the directional cycle signals being trialled further east at the St Asaph / Madras / High intersection. Here we see another set of directional signals being used to help separate out the two movements. It may be a little hard to discern in the photo above, but what appear to be two contradictory cycle signals in fact display different arrows in them to direct riders in the appropriate direction. So far this new intersection seems to be operating OK (it will be interesting to see in the future what it’s like with peak-hour pedestrians and bikes). It’s nice to have some more new cycling infrastructure to play with around the city; starting to feel a bit more connected all up. Have you tried out the new directional signals? What do you think? Wow, I haven’t tried this new layout but it looks much better than the previous hook turn that was there last time I cycled through the intersection. I had to pause for a minute to work the new Antigua lights out the other day, but they worked quite well. The arrows are quite small, but it’s quite clear what they mean. Strickland-Antigua generally is an absolute exercise in frustration though in terms of signalling. It is basically about waiting at lights for half your journey, especially at Brougham and Moorhouse which have an incredibly long east-west phase and no advance sensor, so that if you arrive a second late, you are supposed to wait through an entire green and red cycle – again – even if all of the left turning cars have turned, and the phase for bikes is essentially halved. At the other lights you can end up stopped at a green light with no cars anywhere, pondering whether to ride against the lights. To the northwest of Hagley Park the bike lights are excellent, to the south, you are left under no illusion where bikes sit in the traffic hierarchy. Looking forward to your next blog post Glen 🙂 I couldn’t agree more with Rich. I would like to see cycle signals at intersections such that you refer to ( Colombo and Bealey is another example ) showing green for the first few seconds, then flash amber for most of the rest of the phase before turning red a few seconds prior to the phase end. This will allow anyone who is confident enough to check there is no turning traffic approaching from behind to have a better journey. Traffic turning right on green coming from the other direction and across the path of a cycle will sometimes stop and wait for a person who is waiting on the red light, not realising that it is a red that they are stopped for, rather than them being polite. If there is a group of bikes waiting to cross on the green phase it can be too short for everyone, a flashing amber is a good way of saying proceed with caution. I assume sadly though that, this would require a law change.